If KEC equipment is behind a locked gate on your property, please be sure we have either a key or combination to that lock so crews have access during outages and other work. Failure to provide KEC with this can slow down the outage restoration process. Also, please keep us updated if you change the locks or combinations. KEC can provide members with a lock to interlock with their own so we can access our equipment. Call 208.765.1200 for details. 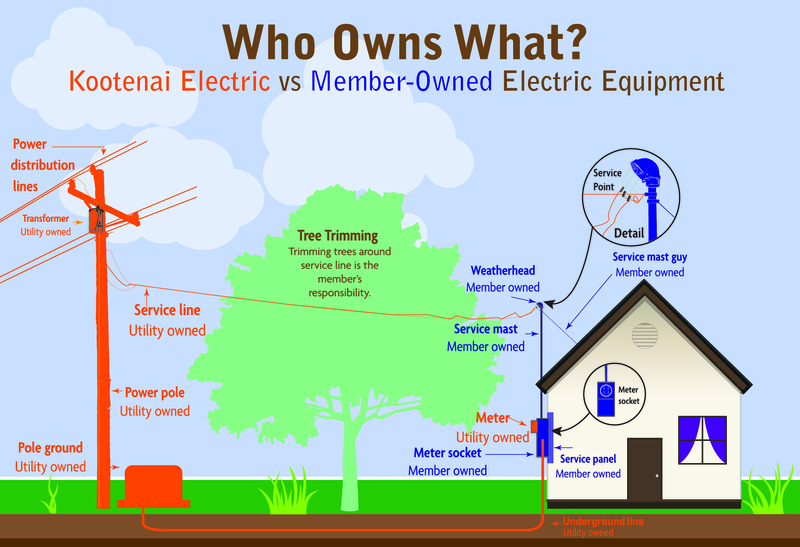 Understanding which equipment belongs to the Cooperative (and is our responsibility to maintain) and which equipment belongs to the property owner (and is your responsibility to maintain) is crucial in ensuring these projects are completed safely and efficiently. It is also imperative that any work on these facilities be completed by those trained to work on energized electrical equipment. Your electric service has two parts, the electric meter and the meter base. The meter is round and typically enclosed in clear plastic or glass. Meters are the property of KEC. Removing the meter requires special training, precautions and safety equipment. Doing so improperly can lead to an electrical explosion. The person working with the meter could be injured or killed. Under no circumstances should meters be removed or relocated—temporarily or permanently—by anyone other than an authorized KEC representative. Please contact us if you’re planning on doing this kind of work and we can send a crew to your site. The meter base is typically a rectangular metal box mounted near or on the outside of your home or business that the meter plugs into. Each meter base might look a little different. It belongs to the property owner and they are responsible for maintaining it in good serviceable order. If it’s damaged by weather or by any kind of accident, repair is the property owner’s responsibility. If you inspect your meter base and believe it needs repair, we encourage you to contact a licensed electrician. Alternatively, you can take a picture of your meter base and send it to KEC using the form below. Sometimes, KEC staff will be able to confirm those concerns or identify other issues that may need to be corrected by KEC as well. There are also occasions when KEC field employees may notice a meter base in disrepair and in those cases the property owner may be notified of their need to have meter bases repaired. A damaged meter base can be a safety hazard for both members and KEC employees. If you have any questions please call us at 208.765.1200. Did you know the voltage levels that KEC provides to you are governed by a national standard? When members call and report a power quality problem, one of the first things we look at is whether the voltage meets the standards set by the American National Standards Institute, or ANSI. ANSI C84.1 is the standard for regulating electric service voltage levels. Sometimes members have the misconception that their voltage should always be 120 volts or 240 volts. In reality, there is a range for acceptable voltage. The reason for this is electric loads on a grid change by time of day and with the season. These changes create variances in voltage. At KEC, we routinely analyze our electrical system and evaluate its ability to provide power to our members within the ranges specified by the standard. When that analysis forecasts a problem maintaining this voltage in the future, necessary upgrades are made well in advance. 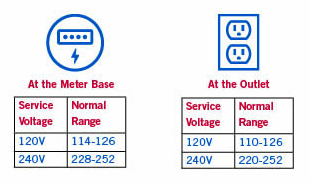 The graphic below gives the ranges for typical household voltage at the meter base and at the outlet.